Promoter Dmitriy Salita of Salita Promotions wishes to congratulate his fighter, female superstar, two-time Olympic Gold Medalist and WBC and IBF Super Middleweight World Champion, Claressa “T Rex” Shields, for her impressive list of victories in the 2017 year-end awards. In just her first full year as a professional, Flint, Michigan’s Shields was named USA Today: Female Fighter of the Year, Yahoo Sports: Female Fighter of the Year, WBAN: Hottest Rising Star and WBAN: Most Inspirational, as well as The Sweet Science’s Prospect of the Year. Shields is also nominated for the BWAA’s Christy Martin Women’s Fighter Of The Year and Bill Crawford Award for Courage in Overcoming Adversity Awards, which will be presented in February. After turning professional in November 2016, Shields appeared three times in 2017, making boxing history on SHOWTIME by becoming the first female to headline a boxing event on premium television. In August, Shields won the WBC and vacant IBF Super Middleweight Championships from previously unbeaten and highly regarded champion Nikki Adler in dominant fashion. And in March, also on SHOWTIME, she stopped Hungary’s Szilvia Szabados in four rounds. Shields also won the WBC Silver Super Middleweight Title in only her third professional fight by scoring a unanimous shutout decision over Louisiana’s rugged Sydney LeBlanc in front of her adoring fans in Michigan in June. Promoter Salita says the sky is the limit for 22-year-old Shields, as her fame continues to pick up momentum with every passing fight. Shields will next be seen Friday, January 12, as she defends her 168-pound titles on ShoBox: The New Generation against undefeated IBF mandatory challenger Tori Nelson live on SHOWTIME (10 p.m. ET/PT) from the Turning Stone Resort Casino in Verona, New York. 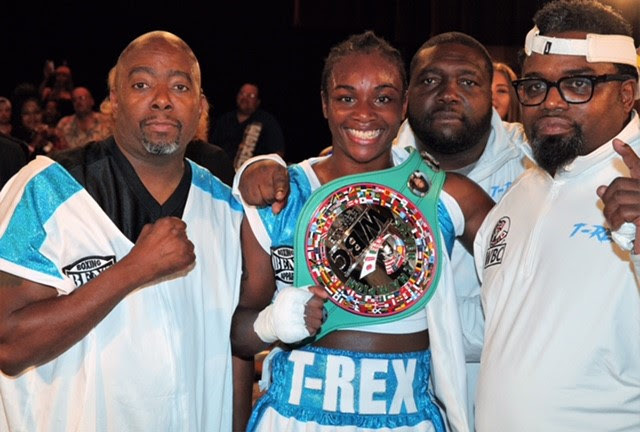 Highlights of the United States fighting debut of current WBC and WBO Middleweight Women’s Champion, and future Shields opponent, Christina “Lady Hammer” Hammer (22-0, 10 KOs) will also be shown.